SAN DIEGO (Sept. 4, 2018) – On Saturday, Sept. 15, Hera Labs will host Hera Venture Summit, an event focused on connecting female founders and funders. 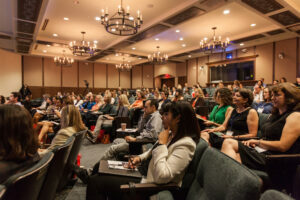 Now in its fifth year, the summit at University of San Diego will welcome speakers and attendees from across the globe to discuss topics around gender-lens investing. Founders and funders gather at Hera Venture Summit 2017. The one-day event returns to University of San Diego on Sept. 15, 2018. Barbara Bry, council president pro tem representing San Diego’s First City Council District, and Michael Lawless, University of San Diego’s academic director of entrepreneurship initiatives, will kick off the event, which will take place from 7:30 a.m. to 7:00 p.m. at 5998 Alcala Park in San Diego. Tech and startup advocates Erica Baker, Laura Gomez, and Maresa Friedman will deliver keynote presentations. Hera Venture Summit is organized by Hera Labs accelerator for women in collaboration with Hera Hub workspace for women and Hera Angels women investors group. The event is sponsored in part by Qualcomm Ventures. The cost to attend is $239 or $287 day-of. Please register at heraventuresummit.com. Hera Labs is a non-profit, female-focused business accelerator that equips entrepreneurs through intensive workshops to launch, grow and sustain profitable businesses. Interactive labs, strategy sessions, and female-founder intensives offer sustained support that allows women-led businesses to flourish. Solving for the entire San Diego startup ecosystem, Hera Labs also connects female founders and funders at its inaugural event, Hera Venture Summit. For more information, please visit www.heralabs.com. Your biggest annual event is coming around the corner and you want it to be the biggest turnout yet. How do you get the word out to the people who would be most interested in attending? How early do you have to start? The earlier, the better. We recommend starting at least three months out. But the idea of not only planning the event but publicizing the event can seem overwhelming when you don’t have a process in place. Good thing you have WordPop! Julia at WordPop serves as secretary on the board of the National Association of Hispanic Journalists – San Diego/Tijuana. Read on to learn more about the club! NAHJ San Diego/Tijuana is one of twelve chapters nationwide working under the National Association of Hispanic Journalists organization. Our chapter is dedicated to the recognition and professional advancement of Hispanics in the news industry. We support this goal by hosting events that strengthen journalist skills and allow members to network with local journalists. I am neither hispanic, nor am I a journalist but I am part of the organization because I support the organization’s goals and have learned a great deal from the organization’s events. Lucky for me, NAHJ bylaws were recently updated so that non-journalists can serve as treasurer or secretary on the board! One of the things I love about this organization is its casual, informal atmosphere. We all work as a team so our roles aren’t as rigidly defined as they might be in other organizations. As secretary, I’m in charge of taking and distributing meeting minutes, but we all play a part in sharing ideas and planning events. What was one of NAHJ’s best events? This group is warm and informal as I mentioned, but it’s made up of and has access to incredibly accomplished media professionals. One of my favorite events was a studio tour at channel 10 followed by a group discussion with two national broadcast media professionals. It was fascinating to learn about their lives “behind the curtain” and how they’re essentially “on” 24 hours a day. After the chat, one of them invited everyone back to her house for a taco fiesta. What’s something you wish everyone knew about NAHJ? I wish more PR professionals knew about this great community resource and the high-caliber events they put on. Now that I’m putting this in writing, I’m realizing this is one of my new goals for the year – to be sure more PR pros know about NAHJ! How can one learn more about the organization? You can visit our website, nahjsandiegotj.blogspot.com, and you can connect with us on Facebook @NAHJSanDiegoTijuana and Twitter, or email NAHJSanDiego@gmail.com to be added to our email list. We don’t spam you, I promise! WordPop kicked off 2015 by planning, coordinating and implementing a one-of-a-kind event for residents of the Morningstar Ranch community in sunny Winchester, just outside of Temecula in Southern California. Award-winning homebuilders Brookfield Residential and Standard Pacific Homes teamed up to host the event and selected WordPop to plan the festive soiree. The builders’ wanted an event that would encourage community engagement and welcome new homeowners to the Morningstar Ranch neighborhood. What better way to celebrate than pizza in the park? Understated Italian-inspired décor achieved a homey feel, while red and white daisies, a sprinkling of baby’s breath, and bold Gingham linens gathered people ‘round the tables. 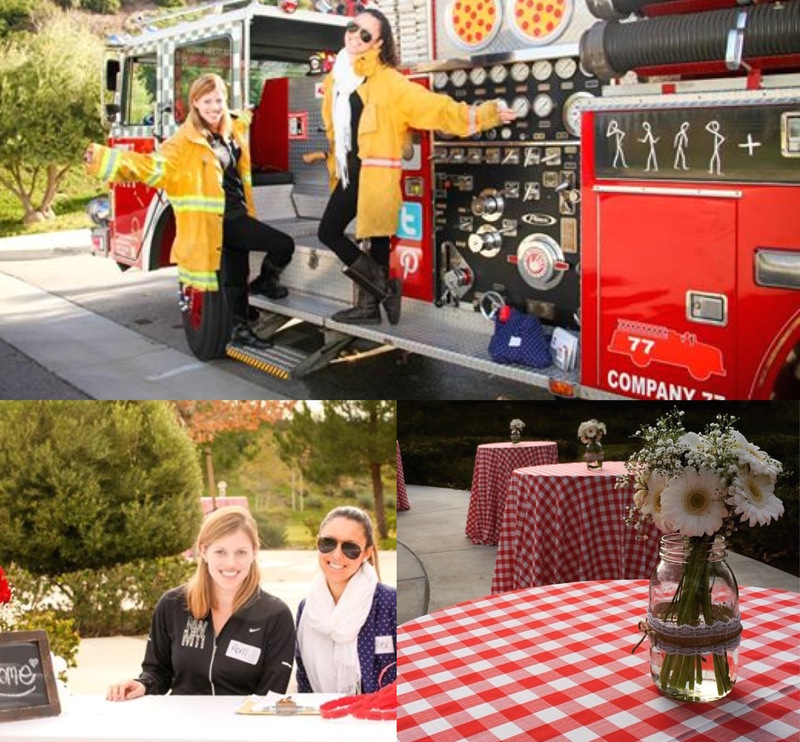 Gourmet artisan pizzas – the focal point of the event – were served on none other than the Company 77 fire truck, packing a punch of fun and flavor! Complete with a Dalmation watch dog, photo booth, rockin’ tunes, and hands-on fire truck props like “extra cheese” and “garlic spray” nozzles, the truck was fun for all! The event was made complete with a balloon artist with designs like ladybug bracelets and bubbly Dalmations, and an outdoor game station. The result? Full stomachs, smiling faces, and neighbors getting to know each other. Moving to a new community can be nerve-wracking, and there’s no better way to create new friendships than through strong community programming and events. Cheers to building homes, and even better, creating community!